This Complete Factory Ford New Holland 8210 (10-Series and 30-Series) Tractor -6- Volume Service Manual includes necessary instructions to maintain and repair your tractor using detailed diagrams and manufacturers specifications. FYI: This is NOT the Aftermarket manual others are selling. This is the Official FACTORY Service Workshop Manual. 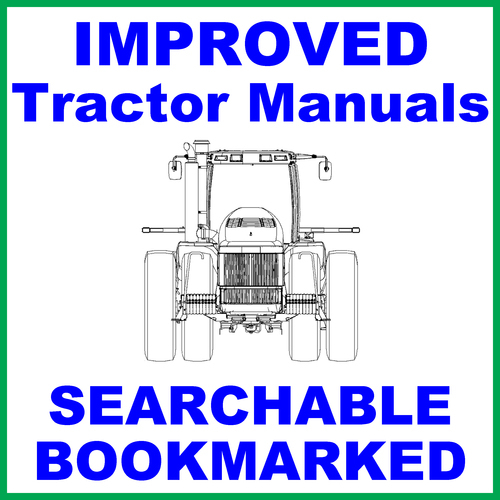 This manual is completely Bookmarked & Searchable for easy navigation that allow you to identify the service repair procedures in the quickest time possible. This Service Manual has 14 Parts contained in 6 volumes. A Table of Contents is included in each volume that lists all 14 Parts and the volume where each can be found. Five Parts have been reprinted from the prior Repair Manual as the service information in these 5 Parts is still valid for the new model series. A page giving a model cross-reference is included in the front of each volume to advise the reader to transpose model numbers. All Parts are subdivided into Chapters which give information on general operating principles, detailed inspection and overhaul procedures and, where applicable, specifics on troubleshooting, special tools and specifications. Ford New Holland recommends that this manual be available for reference at all times.